Whenever you mention the word “fish farming”, people tend to raise a skeptical eyebrow, and usually respond with how they prefer “wild caught”. Even though this is true, there is still a huge movement towards fish farming. Why would this be? Society is trying to bridge the gap between overfishing, fishing until a fish population is depleted, and the ever increasing demand for fish. With this in mind, is fish farming a viable solution? "The more aquaculture there is the more disease there will be." 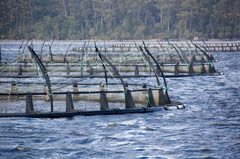 With the demand of the fish farms, environmental groups have been concerned that the feeder fish such as: anchovies, sardines, menhaden and other oily fish will themselves become over fished. 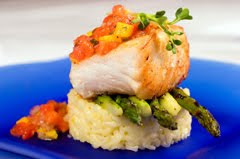 According to Daniel Pauly, Carnivorous fish such as salmon need 2-5 lbs of feeder fish to produce 1 lb of farmed fish. In contract, James Tidwell, the former president of the World Aquaculture society states that 10lbs of feeder fish are needed for 1lb. "Fish-meal fish are nature's forage," he says. "Cropping them merely increases their productivity. “1 Nevertheless, fisheries have been pressured to move towards a vegetarian solution that decreases the amount of feeder fish given to farmed fish. "It takes a lot of protein to produce protein," explains Mooney, the Paul S. Achilles Professor of Environmental Sciences. "We're calling upon the aquaculture industry to create a better feed, one that uses fewer fish. "2 A table from the National Academies Press: Nutritional Requirements of Fish shows that in addition to fish meal the current pellets given to farmed fish contains wheat, corn, soy, and cotton. The pellets have become the solution for overfishing feeder fish, but have created their own controversy. If farmed fish are eating food that is not natural for them, will they really be the best quality fish? If farmed fish are eating food that is not natural for them, will they really be the best quality fish? It appears that they have conquered the waste and disease problems that plague the shrimp industry, but what about the food debate? Because of their bio-security and recirculating system, they do not use chemicals, hormones, or vaccinations which are so common in other fish farming scenarios. Their juvenile shrimp are fed zoo plankton which is naturally acquired in the environment that they have painstakingly created to mirror sea life. This means that the shrimp are eating their native foods and there is no negative impact on the environment. The more mature shrimp are given a soy based protein pellet which satisfies environmentalist, but does not echo nature. Instead of trying to farm carnivorous fish creating a multiplicity of environmental problems, perhaps lessons should be learned from the ancients who used herbivorous varieties. The Chinese have been farming carp, also known as koi, for 2,000 years using an ecological approach where nothing is wasted. Basically, the farmer digs a pond around rice paddies and feeds the fish with weeds from the rice fields. In turn, the waste from the pond is used as fertilizer for the rice fields, and crabs are used to eat pests, a farming system that creates a perfect harmonious balance. There is evidence that ancient Egypt, Greece and Rome cultures have used tilapia, another herbivorous species, in fish farming. Dan Butterfield has adapted some of these ancient techniques on his organic fish farm in Tuscaloosa, Alabama where he raises bass, carp, and catfish in the same pond. He states that the sun and the catfish feces stimulate the growth of the phytoplankton which feed the other species. The natural balance of nature which he employs also keeps his water clean and leads to no waste issues. Fishing has become big business with shrimp being the 2nd import only to petroleum. As demand for seafood increases, companies are trying new innovations to meet that demand. As consumer awareness and “food education” increases, companies are also changing their practices to be more environmentally conscious. Some of the modern practices include utilizing technological advances. Others include going back to traditional ways that have worked for thousands of years. In the end, farm fishing is here to stay. It will be up to the consumer to educated themselves and vote with their dollars on how they wish it to affect the environment, their palette, and their health. 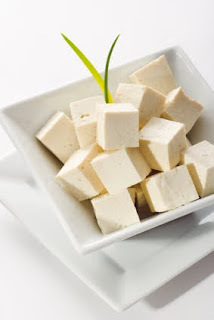 Fresh and Tasty - Make Your Own Tofu in Less Than 25 Minutes. Tofu is an Asian delight that has recently gained popularity in the West. This protein-packed super food has surprisingly almost as much calcium as a glass of milk, and it is low in calories, sodium, and cholesterol. Not only is it low in cholesterol, it is said to actually help reduce it. Tofu is often consumed by menopausal woman as the isoflavones increase the lowered estrogen levels and help regulate hormone fluctuations; however, it is not just for women, the isoflavones are also beneficial for prostate health. With all of its health benefits, why not experience the freshness of homemade tofu? It is surprisingly easy to make in just a few steps, and you will be surprised how much better it tastes than its store bought counterpart. Tofu is made out of curdled soy milk so the majority of the work in making tofu is actually finished once the soymilk is made. (You can find the directions for making soy milk in my previous post). 3. Stop stirring and wait 2-3 minutes. It should immediately start curdling. 4. Check to see if there are more white milky parts left. 5. If so, add the remaining ¼ tsp. Otherwise it is not necessary depending on how firm you wish your tofu to turn out. 6. The tofu should now be separated between the small white curds and the whey (amber liquid). 7. Put cheese cloth into a strainer and pour the whey and curds into it. 8. Place the cheese cloth with the strained curds into the mold. 9. Place a cup on top of the mold and let stand for 20 minutes. So basically, you are just putting some coagulant in the prepared soymilk and then placing it into a mold. How easy is that? Now it is time for you to enjoy your fresh, nutritious creation!